We are pleased to announce that one of the 220 Our Lady of Guadalupe Authorized Relics of Evangelization will be present at our Uniting the Faithful Conference. 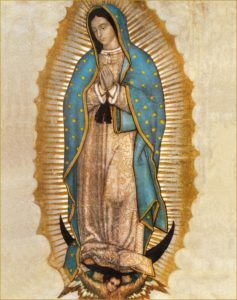 From the Basilica of Our Lady of Guadalupe on May 8, 2004, Cardinal Norberto Rivera Carrera of Mexico led the introduction of the Life and Mercy Crusade, beginning the fulfillment of this prophecy. He blessed the evangelization effort of the relics. There are 194 relics placed in each of the 194 countries (including the Vatican) of the world. Seven relics were prepared for introduction into the United States.